For over four decades Iran’s most notorious prison has been home to hundreds of political prisoners. Evin, which derives its name from a village in the northern Alborz Mountains of Tehran, was built in 1971 during the reign of Mohammad Reza Shah Pahlavi. Previously, it had been the home of Seyyed Zia’eddin Tabatabee, a pro-British politician who was a PM under Ahmad Shah, the last Qajar Shah. After his death, the ownership of his property was transferred over to SAVAK and was then converted into what is today known as Evin Prison. It is a large compound of a few acres and has a wall built all around it. If you go to northern Tehran from the center of the city there is a good chance you will pass by Evin Prison. There are always guards outside, and families waiting to see their loved ones. Evin is known as a prison for political prisoners especially its 209 ward is notorious for that reason. But it is also a prison for many regular offenders and common criminals. In many instances, political prisoners are kept in the same block as others. The prison originally housed 320 inmates and there were 20 solitary cells and close to 300 communal cells. By 1977, it had more than 100 solitary cells especially designed for more famous political prisoners. At that time, there were close to 1500 prisoners in Evin. 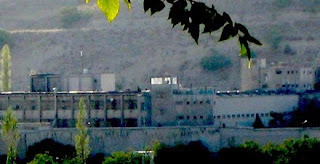 During the Shah, Evin was a detention center for many revolutionary groups such as the Mojahedin, Fedyayeen, and Peykar, whether Marxist or Islamic alike. Members and sympathizers of Iran’s pro-Soviet communist party (the Tudeh) were also incarcerated there. Many prominent clerics such as Grand Ayatollah Montazeri and Ayatollah Taleghani were also imprisoned in Evin before 1979. Hashemi Rafsanjani was a detainee there at one time. Ali Khamenei, the “supreme leader”, was another captive who spent time in Evin. Even Assadollah Lajervadi, who later became the warden of Evin, (given the title of the butcher of Evin) had spent some time there prior to 1979 for allegedly trying to bomb the El-Al office in Tehran. The most famous/tragic incident before the 1979 revolution occurred on the hills of Evin on April 19, 1975 when Bijan Jazani and his group (8 people) were taken and shot to death from the back. It was alleged that they were trying to escape. Among those detained in Evin, many famous prisoners come to mind such as Masoud Rajavi (the leader of Mojadehin Khalgh) Shokrollah Paknejad and Saeid Soltanpour. All three were released after the revolution but the last two were executed during the Islamic Republic. According to a report in one of Iran’s newspapers,“Shokrollah Paknejad, an Iranian opposition leader, condemned by Ayatollah Ruhollah Khomeini, has been executed, an official at Teheran's Evin Prison said today.” Paknejad was executed in 1982. Shortly after the Revolution, Saeid Soltanbpour who was a poet was taken to the gallows on his wedding night at the orders of the new regime in Tehran and Qom. “I can still hear the words of Saeed Soltanpour (the executed Iranian poet) who once famously ‎asked: What has happened to my country?” writes Housang Asadi, a journalist and a prisoner of consciene himself who was also detained and tortured severely. Asadi was imprisoned for 16 years both under the rule of the last Pahlavi Shah and later under the Islamic regime. In fact, Houshang Asadi was for a period of time the cellmate of the "Supreme Leader." In 1979, immediately after the revolution, at the direct orders of Dr. Shapur Bakhtiar, who was only Prime Minister for 37 days, the doors of Evin and other prisons were opened and all political prisoners were released. It was a jubilant day both for the prisoners and their families. Bakhtiar wrote: “In the first days of taking office, I ordered the opening of Iran’s prisons and released all the political prisoners, except for the few who had committed murder.” A few years later, Dr. Bakhtiar was stabbed to death by agents of the Islamic Republic in his home in Paris. Among the most notable of Iran’s political prisoners in Evin is Abbas Amirentezam, deputy Prime Minister under Mehdi Bazargan, who was arrested upon his return from Sweden in December 1979. He was tried and jailed on a fabricated charge of espionage, as many have been over the last 30 years. Amirentezam is the longest serving political prisoner of Iran. He has been on a leave of absence after spending 27 years in Evin. Amirentezam says: “those were the worst days of my life. I will never forget a single moment of that pain. The best time was when after five years, I was allowed to have books and was given both books and newspapers to read and paper to write my notes on. I was finally able to have some contact with the outside world. “From time to time, the head guard would come in. They were two women. They looked ugly and big and extremely rude. They were pros. I was told they were there from the Shah's era. Their names were Bakhtiari and Alizadeh. They would kick us real hard. The Bakhtiari woman wore a soldier's outfit and she would constantly curse us and beat us. She barked like a dog! Marina Nemat, who was born into a Russian Christian family, spent two years in Evin from 1982, having participated in anti regime protests at her school. She was tortured in Evin prison and sentenced to death. Her sentence was later commuted to life when a prison guard by the name of Ali Mousavi fell in love with her and forced her to marry him. Under pressure, she married him only to leave when he was murdered by other guards. She left Iran for Canada in 1991. Her book, Prisoner of Tehran was published in 2007. (Some women prisoners have questioned her account, though Shahrnoush Parsipour has corroborated her story. One of the most famous women prisoners in Evin is Mehrangiz Kar, a human rights lawyer, who spent 53 days in solitary. She later shared a small cell with the well known publisher, Shahla Lahiji. Mehrangiz Kar writes: "Like other women who had been handpicked, I tried to get closer to those whom we shared our thoughts with. It was obvious that confinement of a woman for political reasons alongside others who are accused of prostitution or drug addiction is in total disregard of all international laws. But where should we speak of these injustices. Everything and every word have its respective place." Shahrnoush Parsipour spent four years and seven months in Evin. She had been imprisoned for 54 days under the Shah in the same prison. Monriou Ravanipour, a novelist, was also arrested and imprisoned for a long period. In front of us were other prisoners. The Evin guard started insulting them. Dr. Davaran asked me "Why is he so insulting?" I said, "Don't worry he is not insulting us." As soon as a young guard saw Dr. Davaran, he said, "Father what you are doing here? Did the ministry of intelligence arrest you?" I said no, the Tehran prosecution office. He asked, "What did you guys do anyway?" I replied, we wrote a book and as a result we were arrested." He said, "Didn't you have permission?" Dr. Davaran said, "Yes, we did obtain a permit for the publication of our book, yet they arrested us anyway." He looked around and said in a funny tone, "What a screwed up country!” (Ajab mamlekat khar too kharist)! He told Davaran, "I am so sorry about this. I am truly sorry that you are here." He said to a guard, "Take them to Section 1." They wanted to handcuff us but the same guy said "no, no handcuffs." I noticed that the prison conditions had changed from 13 years ago. There was TV and AC in every room. I saw that prisoners could call their loved ones and most prison officials were acting more civilized. I attribute this change to the Khatami era as well as international pressure on the conditions of Iran's prisons. who went on a hunger strike for months and almost died as a result. Ganji was arrested for writing several books exposing the serial murders of 1998. While in prison, he wrote his famous manifestos which question the Islamic regime's legitimacy on political as well as ideological grounds. Others include, Heshmatollah Tabarzadi, head of a student organization, Mohsen Sazegara, a former member of the revolutionary Guards (in 2003), Nasser Zarafshan, a lawyer for many prisoners, Akbar Mohammadi and Ahmad Batebi who were arrested during the 1999 student demonstrations at Tehran University, and Ali Afshari, a student activist and member of the Daftar-e Tahkim-e Vahdat (The Student Coordinating Committee) who was arrested in 2000 and held until 2003. Afshari was in solitary confinement for nearly 400 days. Hojatoleslam Mohsen Kadivar, Siamak Pourzand (missing in 2002 first, later found at Evin) and Hashem Aghajari (arrested in 2002) were also prisoners in Evin. Akbar Mohamamadi was one of the prisoners who died in Evin after undergoing severe torture. He was arrested during the 1999 student uprising and spent nearly 5 year in prison. He was released and was re-arrested in 2006 after writing his memoirs (Ideas and Lashes) He died under torture in Evin on July 30, 2006. He was in Evin with Ahmad Batebi. Both were arrested during the July 9, 1999 student demonstration. Ahmad Batebi became a symbol of the student movement. He spent nearly 15 years in prison. In March 2005, Batebi was temporarily released from Evin in order to get married. He failed to report back to prison. On June 23, 2005 a newspaper interview reported him "currently on the run, avoiding the authorities in Iran". Batebi was re-arrested on July 27, 2006 and re-imprisoned. He continued to serve his sentence. He was held in notorious Section 209 of Evin Prison which is run by the Ministry of Intelligence. After finally posting bail, he left Iran clandestinely for the US in 2008. He was later released on bail. He endured harsh interrogation and torture in Evin. Iranian American journalist, Roxana Saberi was arrested in January 2009 and released in May 2009. She was also charged with espionage. She had been living in Iran for many years before her arrest. Nazi Azima of Radio Farda was also held for months before she was released. Maziar Bahari, a reporter for Newsweek, is currently in detention in Evin after he went to Tehran to cover the June 2009 elections. Roozbeh Mirebrahimi said of his days in detention: “Most of the time I was in the special secret prison of the security forces connected to the office the prosecutor of Tehran for interrogation. Only the last 6 days I, along with 4 others who were charged with me came to Evin. We were kept in a cell. Our cell was in the 4th ward of Evin prison which is known as the ward for those awaiting executions. In one of our cells there was a professional killer whose name was Mohammad Bijeh; he had abducted dozens of kids, raped and burned them. There was another common criminal who was also waiting to be executed. The reason they took us to this special ward was to frighten us so that they could go ahead with their plan. The plan of confession and show trials and making us sign confessions that we have repented. The condition in Evin for me who had spent days in that horrific prison blindfolded, and interrogated and tortured was more tolerable. Of course this is my own experience in Evin. I am sure today many are experiencing a different and far worse situation in prison. Since the disputed 2009 elections, Shadi Sadr, a lawyer, (she was released recently) Jila Bani Yaghoub, a woman activist, and many other women civil rights activists are still in detention in Evin. Other political prisoners of conscience, men and women, who spent time in Evin include: Hassan Yousefi-Eshkevari, Ebrahim Nabavi,Emad-ed-din Baghi, Fariborz Raeiss-Dana, Mahmoud Dolatabadi, Mohammad Ghoochani, Mashallah Shamsolvaezin, Latif Safari, Khalil Rostamkhani, Manouchehr Mohammadi, Alireza Alavi-Tabar, Mohammad-Reza Jalaïpoor, Saeid Sadr, Mohammad-Ali Sepanloo, Ezatollah Sahabi, Shahla Sherkat, Shahla Lahidji, Jamileh Kadivar and. Khadijeh Hajdini-Moghadam. (Most of the above had attended the Berlin conference and arrested upon their return in 2000). Recently I visited the first concentration camp under the Hitler regime, Sachsenhausen (Oranienburg), located near Berlin. It was the first detention center of the Nazi regime which held political prisoners-Jews, social democrats and communists. After the war, it became a Soviet detention camp. Today, it is a visitor sight reminding people of what humans are capable of doing to each other. Yet, after sixty- five years, we still have not learned. Crimes against humanity still continue throughout this world. I only hope that one day, Evin, will become a memorial commemorating those who endured interrogation, torture and murder. In the midst of despair, darkness and terror, they confronted their oppressors with courage and defiance. May all Iranian political prisoners see freedom soon. May their families embrace them even if their bodies and souls have been shattered. May their captors be held responsible and tried in a court of law, something that they denied others. *This report is far from being complete. There are numerous men and women whose names have not been cited here, known and unknown ones. I only hope that readers will add to the long excruciating list. All and all the number of those who have been executed or perished under the Islamic Republic is far greater than under both Pahlavi rulers combined.